French painter and draughtsman. In 1678 he was apprenticed to Guy-Louis Vernansal; he later became a pupil of Jean Jouvenet and in 1684-85 of Bon Boullogne. By 1684 he was enrolled at the Acadmie Royale, Paris, and a year later won the Prix de Rome with his Construction of Noah s Ark (untraced). He probably arrived in Rome towards the end of 1685, and he stayed until the winter of 1688-89. While in Italy he studied the work of Raphael and the Carracci family, as well as showing an interest in Correggio. He also led a student protest against the teaching rgime of the Acadmie de France in Rome. After some months in Lyon he returned to Paris in 1689 and began to work on minor commissions, including drawings of the statues in the park at Versailles (Paris, Bibliothèque Nationale). The influence of the Boullogne brothers is evident in his small-scale paintings of this time, such as Mercury Killing Argus (c. 1690-95; destroyed), with its graceful but stylized figures and clear, Flemish-derived colours. Two works of the turn of the century, Joseph and Potiphar s Wife and Susanna and the Elders (both 1699; Amsterdam, Rijksmuseum), indicate that he was in the forefront of the contemporary movement in religious art towards small-scale works destined for private collectors. Although sacred, the subjects were capable of a secular interpretation, and Bertin exploited this ambiguity to the full. 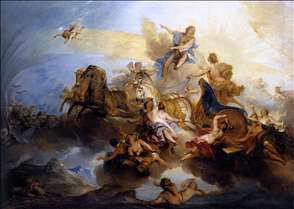 See more details about "Phaéton on the Chariot of Apollo"